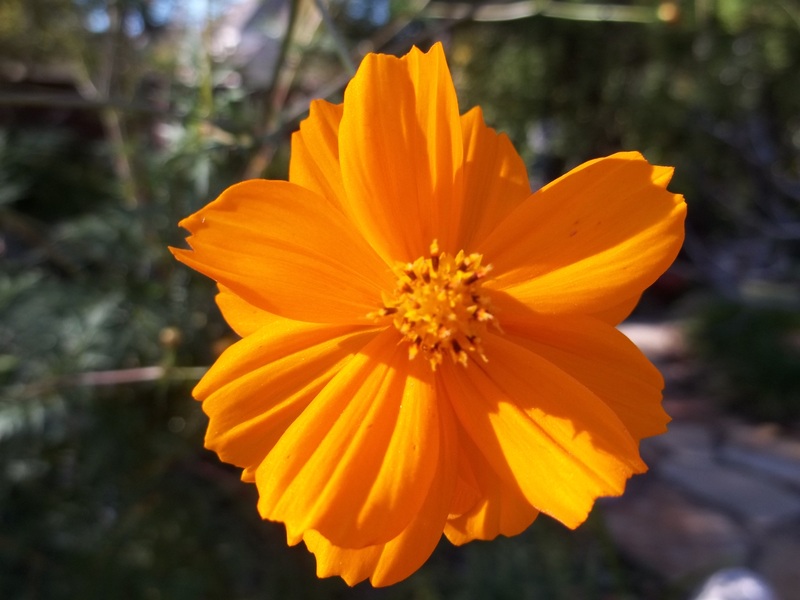 A seed from some Cosmos planted in a nearby bed drifted over to a flower pot where this bloom is on a single plant that has become a giant reminder of parent plants much smaller and long gone. This is more a bush, and is now taller than me! 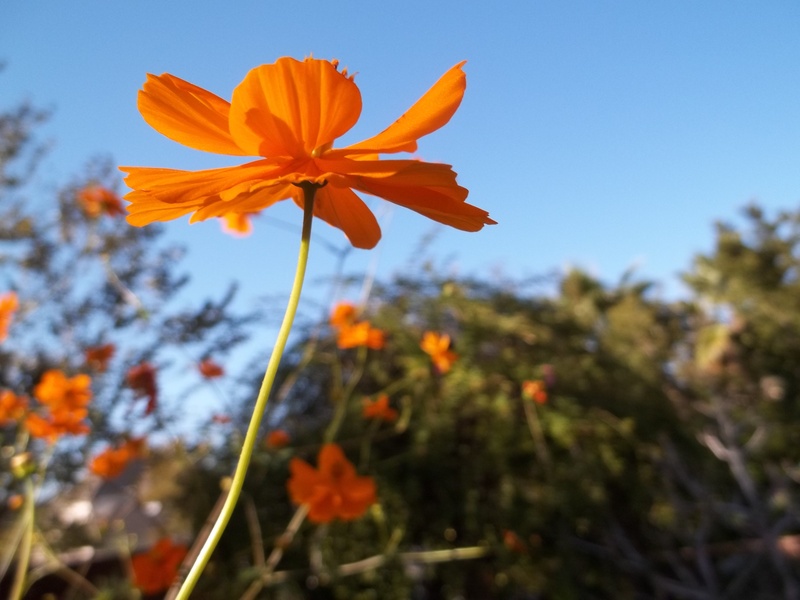 It is covered with flowers that compete with the sunset in their vivid color. It is an unexpected gift and I love it. 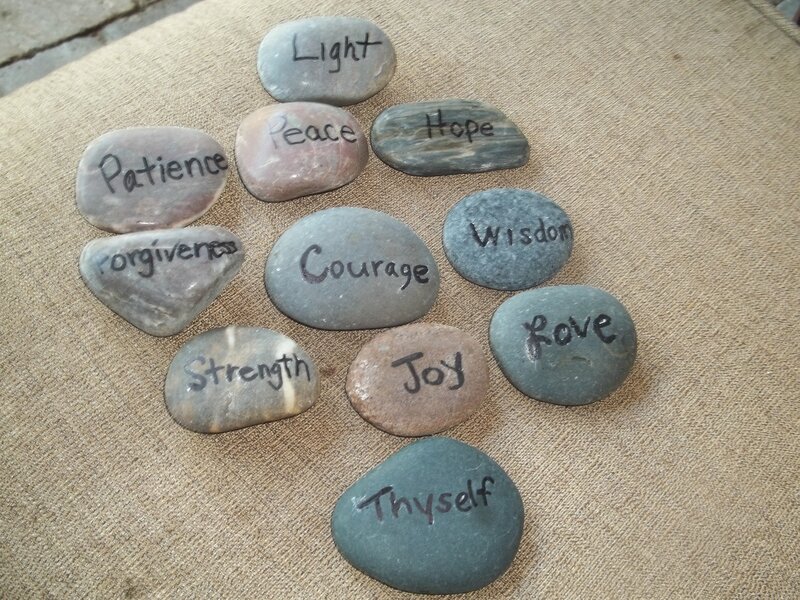 I keep a small basket of smooth stones, each marked with a word, on the back porch which I use like prayer beads. Somehow, as I lift a stone and place it beside me with a prayer for each thing the word I have written there represents, I am able to focus more sharply and receive these gifts. I keep the same list by the coffee pot in the kitchen and can cover it with the palm of my hand in my petition. Laying the stones down is a random process, so I am drawn to the pattern on this particular day when I look at all of them together. I begin with seeking Light and the progression leads me to the most important request, “Thyself.” I realize that if I could have only one request it must be that, for it is in the presence of God I find the all the rest. The poetry of John O Donahue helps me imagine he might have had a basket of stones, too. Recently our favorite garden center had a greenhouse sale. It is hard for me to pass up plants we love to have in our garden on sale for $2, so I came home with a large healthy milkweed. I parked it on the back porch until I could pick a good spot in the yard for it. 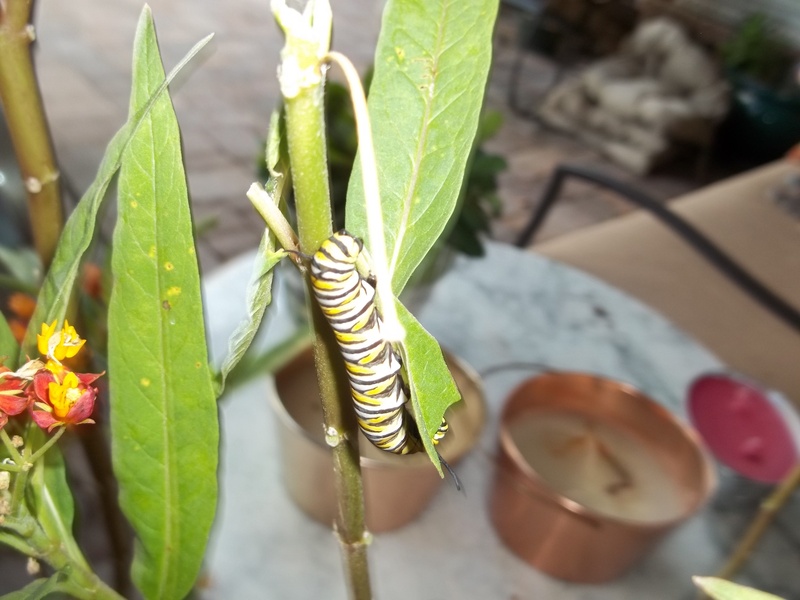 I shouldn’t be surprised since I know that milkweed is the only plant on which Monarch butterflies lay their eggs, but was pleasantly amazed the next day when I discovered my lagniappe – 6 tiny caterpillars munching away at the milkweed leaves. I had to laugh as I remembered a conversation I overheard while I was looking at the nursery plants. A lady standing next to me said yes, this was a good buy for such a large plant but she had one like it and caterpillars kept eating it up. I smiled and reassured her that meant she would have alot of butterflies, too, since the caterpillars would crawl off to neighboring spots, form a chrysalis, and emerge as Monarchs. She looked at me and stomped off complaining that the butterflies were OK but she couldn’t take the caterpillars. It is true, the little yellow and black wigglers completely stripped my new plant, so much that I took caterpillars and all out to another milkweed in the garden and let them lunch there too. 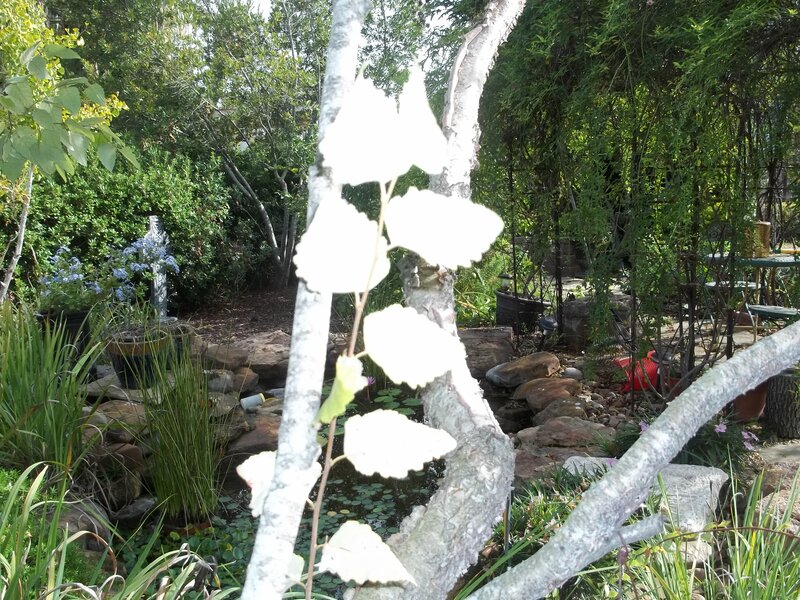 Within a few days there were no leaves left, and no caterpillars either. Now as I enjoy the flickering color of butterfly wings I am happy they had what they needed to become what they are. Today I see that both milkweed plants have new leaves popping out all along their branches. I am thankful for learning to let the caterpillars be. We picked up one excellent word — a word worth travelling to New Orleans to get; a nice limber, expressive, handy word — “lagniappe.” They pronounce it lanny-yap. It is Spanish — so they said. We discovered it at the head of a column of odds and ends in the Picayune, the first day; heard twenty people use it the second; inquired what it meant the third; adopted it and got facility in swinging it the fourth.”… It is something thrown in, gratis, for good measure.